Two Health Fairs a Year Better Than One? HR and benefits professionals - this post is to help you when determining the time duration of your employee health fair. You don't want a health fair that is too short - where you have employees showing up as vendors are leaving. And you don't want a health fair that's too long - where vendors are standing around twiddling their thumbs or packing up and leaving early. Neither one of these outcomes is ideal. The main thing to keep in mind when deciding a health fair duration is the number of employees you have working on site at your office/work location. From experience, the average turnout we typically have seen at employee health fairs is 25-35% of the total onsite, employee population. And if your health fair is offsite, after work hours, or on the weekend, expect this percentage to drop substantially - so naturally, I recommend staying away from these types of situations. Now keep in mind, these recommendations are based off a typical health fair. You might need to make your health fair longer if it's mandatory for your employees to attend (I have seen this), if there are cash/premium incentives for their attendance, or if you're providing lunch. None the less, these recommendations are a good jumping point when planning your health fair and deciding on your event duration. Simply put, we offer the only nationwide health fair planning tool that helps HR and benefits professionals automate 95% of the health fair planning process. The coolest part: it's like online shopping for health fair vendors. This tool is completely free to use, and you can get started at any time by clicking here. 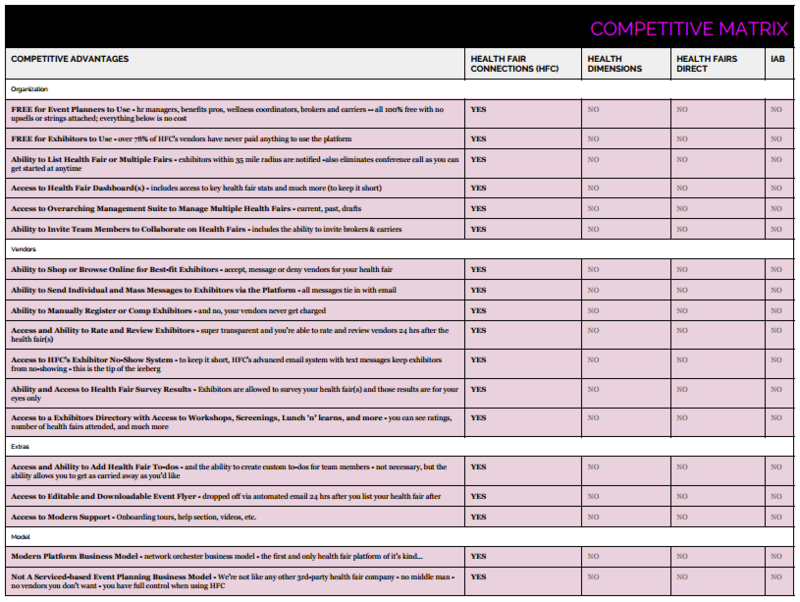 Link to large PDF of Competitive Matrix.